Over the years I have befriended some birds that are territorial in my neighborhood; they live there and don't migrate. 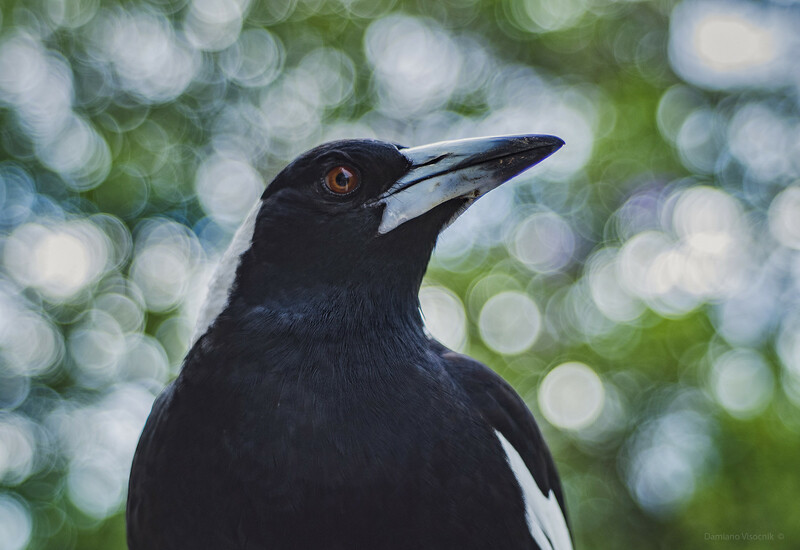 Magpies are often seen roaming around gardens and are rather used to people in the suburban sprawl. 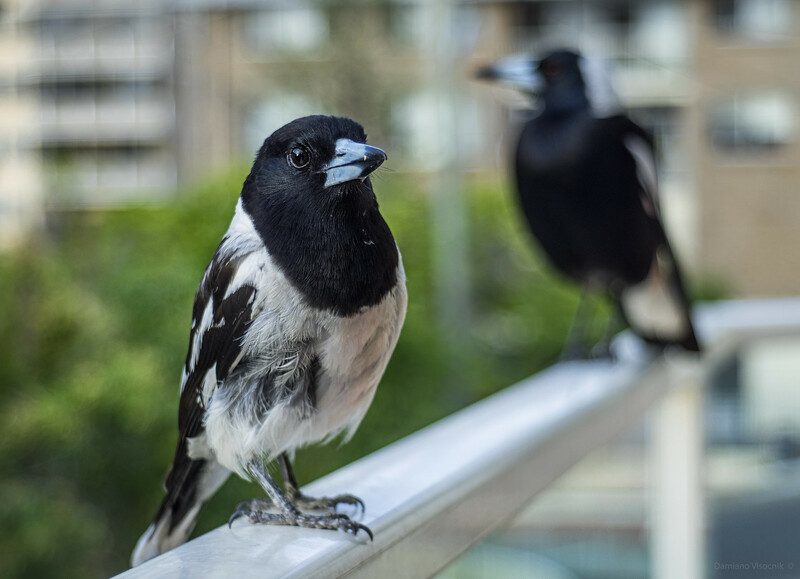 From my initial timid toss of some cheese towards them, the magpies soon regarded me as a "friendly" person (they can recognize dozens of people and they form an opinion if you are deemed as "safe"). It did not take long for them to fly in onto my balcony when they saw me around and started to expect a hand out every so often. I was more than happy to have the feathered guest: after all they sing much nicer than the crows. And then all of the sudden they disappeared: did not see them for a month. 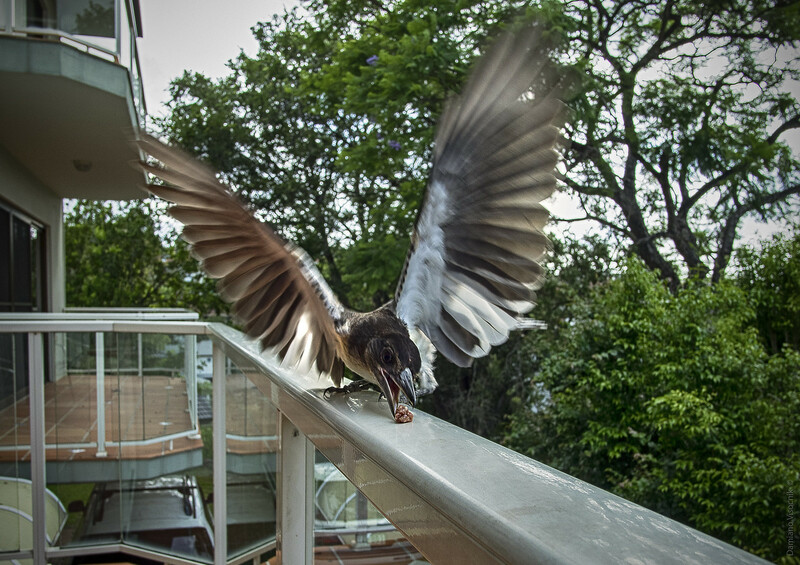 Eventually returned and were more hungry than ever but rarely consumed their food on the balcony: they would fill up their beak and fly away to return a short time later. Something was going on: they must have young ones that they are feeding? 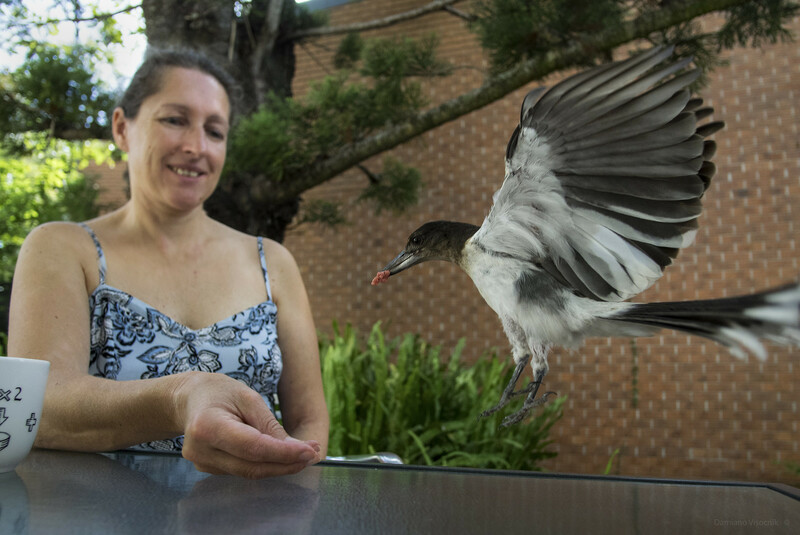 I was right: one day I saw a brown looking, fluffy feathered nagging (for food) bird in the nearby tree with parents now shuttling food from my hand to him. 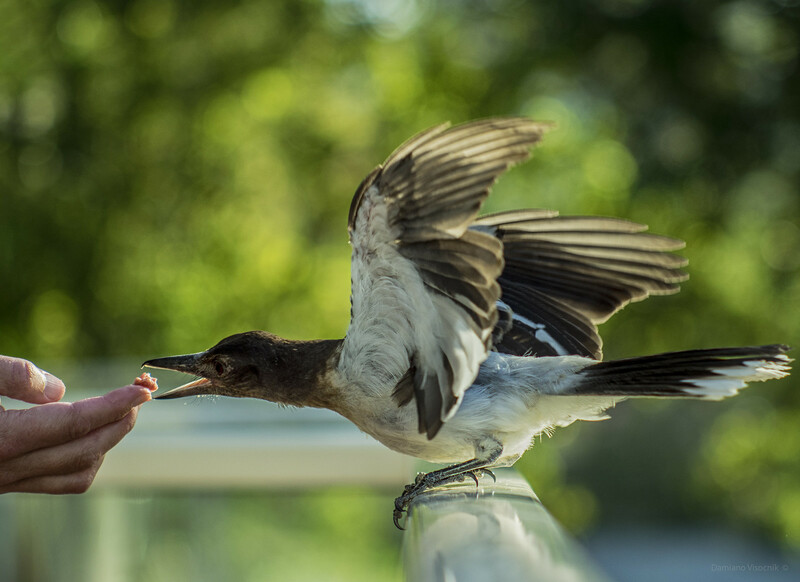 A week or so and the young one was able to fly well enough to be brought closer and soon he was right beside the parents, eventually accepting food from my hand. A few timid bights (some to my fingers when he missed) he now can feed himself rather well. 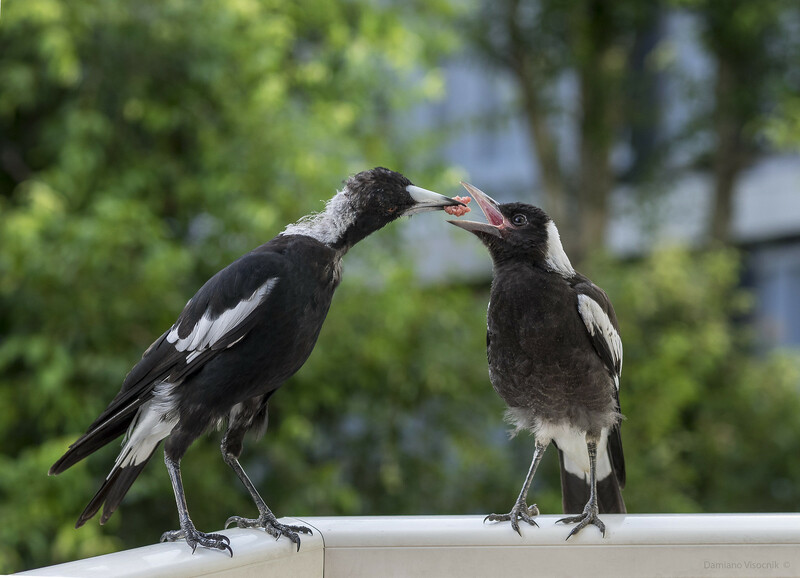 At the same time the Butcher Birds also started to observe that good food was handed out at my place; they soon joined in and after some initial protests from the magpies are now on friendly terms: there is enough food for all. And yes, the butcher birds also has their young which is much more cheeky than the magpie chick.